Still trying to figure out weed control? Have questions about organic corn, soybeans, alfalfa, and/or sorghum? Want to learn more about soil health? Then you are not going to want to miss this upcoming organic field day on Thursday, September 6 from 9am-4pm at Stoller Organic Dairy Farm LLC, 10451 Eby Road, Sterling, Ohio. The Stoller family have been Organic Valley members for years and are excited to share how they manage their cows, pastures, crops, and rotations. Currently, they’re milking 180 cows and grow organic corn, soybeans, wheat, rye, as well as pasture, alfalfa, and clover. Guests will be able to check out their crops, along with their extensive organic corn & fertility plots. They also will be displaying equipment they use for weed control – harrows, rotary hoes, cultivators, Einbock tine weeder, and an optic guidance cultivator. Gary Campbell will be discussing how effective weed control begins in the soil and will be offering various programs to help manage your weeds. He’ll be joining other speakers from the Stoller Family, Doebler Hybrids, Blue River Hybrids, Fowler Seed marketing, Masters Choice Hybrids, Jabb of the Carolina, Organic Valley, and JDS Seeds. For more information or to RSVP (by August 31), contact John Daniel Schlabach (JDS Seeds) at 330.683.7321 or 330.465.1794. A barbecue chicken lunch will be served at noon. *Can’t make this event? That’s OK! Come to the organic field day on Tuesday, September 4 from 9:30am-3:30pm at the Johnny Byler Family Farm at 5544 Mansfield Adario Road, Greenwich, Ohio. The same topics will be discussed, except Reggie Destree (organic consultant) will be speaking. Contact John Daniel Schlabach to RSVP. Here’s another opportunity to learn about fall fertility if you missed us at any of our summer events. We’ll be speaking on ways to increase biological life in the soil and the many successes we’ve seen in crops this year at an informational meeting hosted by Tom Besecker of Advanced Biological Solutions on Thursday, November 9 from 9:30am-3:30pm in Cynthiana, Ohio. We will be joining speakers Reggie Destree and Tom Besecker to bring you a day jam-packed with useful information. Reggie will be sharing about soil health, pest & disease control, weed control, and vegetable production. Tom will be sharing about cover crops and tips to improve pastures. We are so excited to be a part of this event and sincerely hope you can make it too! A complimentary lunch will be provided for those with advance registration. Please RSVP to Tom Besecker at 937-459-5104 or Michael Auker 937-365-1329 by November 3. The meeting will be held at the Town Hall in downtown Cynthiana. Darry Neuenschwander and Sons – 8:00 a.m. at 2887 West Lebanon Road South, Dalton, Ohio. Darry and his sons have a conventional dairy and grow corn, alfalfa, and soybeans. They plant non-GMO corn for silage and grain. They applied SP-1™ with 28% nitrogen at planting and are having an excellent crop year so far. Guests will get the opportunity to visit farms such as this one operated by Scott Stoller, which will wrap up the day’s tours. Woodlynn Acres Farm – 9:00 a.m. at 647 South Kurzen Road, Dalton, Ohio. Fred and Scott Myers farm about 3,000 acres with about 1,200 acres in hay production. Last year they transitioned 1,000 acres to organic production, plus had 60 acres of certified organic corn and 200 acres of certified organic hay. This year they are transitioning an additional 1000 acres. They have used AgriEnergy corn starter and applied foliar fertilizer to their hay, corn, and small grains. They will be showing the modern equipment and technology they use to get the job done. Venture Heritage Farm – 10:15 a.m. at 13777 Arnold Road, Dalton, Ohio. Jon is farming on Steve Steiner’s farm. We’ll look at his organic no-till corn planted into hairy vetch, along with his vegetables and small scale equipment. Ervin Miller, Jr. Farm – 10:45 a.m. at 4347 Welty Road, Apple Creek, Ohio. Ervin and his family grow organic corn, soybeans, hay, and pasture. He has been using AgriEnergy products for several years and has been using 4010 forage peas as a spring slowdown crop with excellent results. He uses a variety of tools for weed control and bought a new Multivator (in the row rototiller). Jake’s Restaurant – 12:00 p.m. at 6655 East Lincoln Way, Wooster, Ohio. Join us for lunch at Jake’s. Trent Troyer Farm – 12:45 p.m. at 5537 South Apple Creek Road, Apple Creek, Ohio. Trent Troyer is growing organic corn, hay, and soybeans and has been using AgriEnergy products for six years. He has 5 broiler houses where he sells and spreads broiler manure. See how he utilizes broiler manure and foliar application on his farm. Greenfield Farms Cooperative – 1:45 p.m. at 6464 Fredricksburg Road, Wooster, Ohio. Tour Greenfield Farms’ dry fertilizer mixing plant and their warehouse distribution center. See local produce being brought in and prepared for shipment to area retailers. David Colvin Farm – 3:00 p.m. at 9135 Geyers Chapel Road, Creston, Ohio. David and his family are members of Organic Valley and have an organic dairy, and also grow corn silage, alfalfa, and pasture. They are using AgriEnergy starter and foliar programs on their farm. Stoller Organic Farm – 4:00 p.m. at 10451 Eby Road, Sterling, Ohio. Scott and his family are Organic Valley members and grow organic corn, soybeans, wheat, oats, hay, and pasture. Scott uses a variety of tools for weed control and was one of the first farmers in the area to use AgriEnergy products. He also built a new milking parlor and expanded his herd. This year he has a large organic corn variety plot, a soybean plot, and a fertility plot for AgriEnergy. There is no need to RSVP for any of the farm tours; just show up and attend as many as you prefer. Feel free to stay the whole day or enjoy only a handful of tours. For more information call John Daniel Schlabach at 330-465-1794. ALSO, if you’re in the Evansville, Wisconsin area on August 3, be sure to visit us at the Doudlah Farms Organic Field Day from 8:00 a.m. – 5:00 p.m.at the Cooksville Community Center, 11204 N. Church Street, Cooksville, Wisconsin. Organic Farmer Mark Doudlah will be showing some of his farming practices that include several of our products. Call him at 608-490-0926 or mark.r.doudlah@gmail.com to reserve your spot! Here’s another opportunity to learn about fall fertility if you missed our summer seminar about a month ago. We will be speaking on nutrient management and profitability with starters, foliar feeding, and fall fertility programs at an informational meeting hosted by Tom Besecker of Advanced Biological Solutions on November 1 from 9:30am-3:30pm in Cynthiana, Ohio. A complimentary lunch will be provided for those with advanced registration. Please RSVP to Tom Besecker at 937-459-5104 or Michael Auker 937-365-1329 by October 26. The meeting will be held at the Town Hall in downtown Cynthiana. Stoller Organic Farm – 8:30 a.m. at 10451 Eby Road, Sterling, Ohio. Scott and his family are Organic Valley members and grow organic corn, soybeans, wheat, oats, hay, and pasture. Scott uses a variety of tools for weed control and was one of the first farmers in the area to use AgriEnergy products. He also built a new milking parlor and expanded his herd. Andy Mast Farm – 10:15 a.m. at 3444 East Messner Road, Wooster, Ohio. Andy and his sisters grow organic produce for Greenfield Farms. They have focus on growing squash, zucchini, and kale. Andy will discuss what he has done to make his farm more productive. Join us in the discussion. Greenfield Farms Cooperative – 11:00 a.m. at 6464 Fredricksburg Road, Wooster, Ohio. Tour Greenfield Farms’ dry fertilizer mixing plant and their warehouse distribution center. See local produce being brought in and prepared for shipment to area retailers. Guests will get the opportunity to visit farms such as this one operated by Scott Stoller, which is also the first stop of the morning. Ervin Miller, Jr. Farm – 1:15 p.m. at 4347 Welty Road, Apple Creek, Ohio. Ervin and his family grow organic corn, soybeans, hay, and pasture. He has been using AgriEnergy products for several years and his crops look good. He uses a variety of tools for weed control and bought a new Multivator (in the row rototiller). Woodlynn Acres Farm – 2:30 p.m. at 647 South Kurzen Road, Dalton, Ohio. Fred and Scott Myers farm about 3,000 acres with about 1,200 acres in hay production. This year they made the decision to transition about 1,000 acres to organic production with 60 acres of organic corn and 200 acres of organic hay this year. They have used AgriEnergy corn starter and applied foliar fertilizer to their hay, corn, and small grains. Their organic corn looks very good and their organic hay quality was excellent. Join the discussion of their farming practices and see the modern equipment and technology they use. Craig Stoller Farm – 4:00 p.m. at 14665 Mt Eaton Road, Rittman, Ohio. Criag Stoller and his family are Organic Valley members and milk Holsteins. He is a young farmer that has been using AgriEnergy products for several years. Join us as we visit his farm and discuss his farming practices. A field visit in Six Lakes, Michigan in mid-June was filled with rave reviews of some of the effects our products have had on a transitional hay field. The farmer operates a dairy operation and is wrapping up his final transition year. Transitional hay ground in Six Lakes, Michigan. Jersey cows grazed this field early spring prior to a SP-1, Pillar, K-Sulfate, and fish application. In late May, the first cutting of hay was completed. Currently the farmer is gearing up for a second cutting and has been very pleased at how green and lush this grass is compared to area fields. He even noted better stands. Need help “greening up” your hay field fertility program? Comment below with your location and we’ll get you in contact with the right person! Is grass fed beef no longer a niche market? Until a few years ago, grass fed beef wasn’t well marketed. Today, the consumer is demanding grass fed beef. If you’re a beef producer, we want to see you meet the needs of your growing customer base by helping you improve your pasture land. 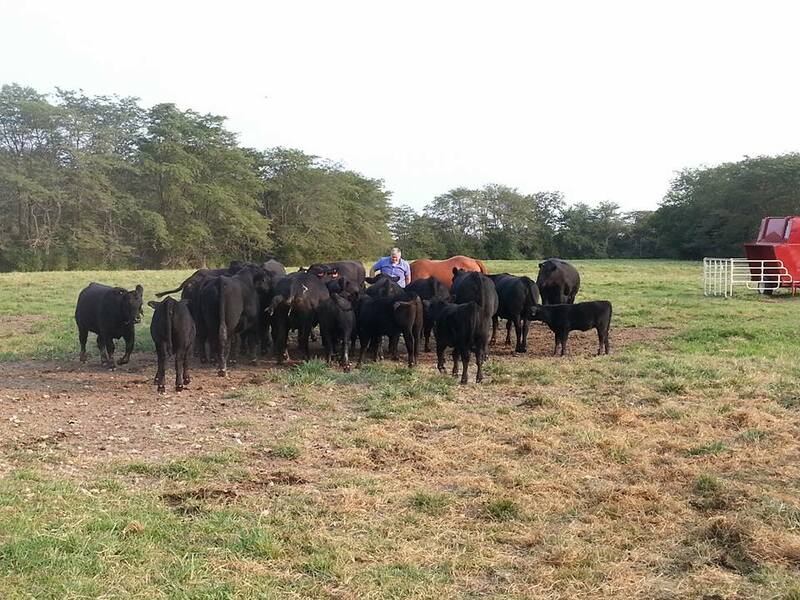 What kind of grass fed beef story would be complete without a picture of cattle in the pasture?! With that said we will be at the 2015 Grassfed Exchange Conference tomorrow and Friday at the Comfort Inn and Suites in Mt. Pleasant, Michigan. The Grassfed Exchange desires to help producers understand the possibilities for finishing cattle correctly on grass to produce the best quality grass fed beef possible. We hope to join them in helping producers grow in knowledge of the grass-fed industry and in finishing cattle specifically. The conference will be jam packed with pasture walk tours and presentations by some of our customers including Wayne Rasmussen and Luke Linnenbringer. We will also have a booth at the trade show starting at 10:00 a.m. Thursday through Friday at 4:00 p.m. Be sure to swing by and say hi to one of our agronomists, Gary Campbell. He personally told me right before he left that he is so excited to see what this year’s conference will bring so be sure to make it up to see him!